For many musicians, making the step up from sideman to bandleader can be problematic. Other musicians embrace the role and seem to enjoy the added responsibility. That’s the case with guitarist Thomas T. Dahl. He founded Skydive Trio, who recently released their debut album Sun Moee on Hubro Music. Since then, Thomas T. Dahl star has been on the ascendancy. However, that’s not surprising. Music is in Thomas T. Dahl’s blood. It always has been. He was born on 7th September 1973, and from an early age, immersed himself in music. It was no surprise that Thomas enrolled on the prestigious Jazz Programme at the University of Trondheim in 1993. The same year, Thomas mad his musical breakthrough, with Krøyt. Thomas joined Krøyt in 1993, the year the band were formed. Then two years later, Thomas joined another band, Dingobats. For the next five years, Thomas juggled his studies and musical career. This included working on Krøyt’s debut album. Four years after they first formed, Krøyt released their debut album Sub in 1997. By then, Krøyt were an experienced band. They had spent the previous four years honing their sound. This paid off when Sub was released in 1997. It was well received by critics. Great things were forecast for Krøyt. That proved to be the case. Before that, Thomas’ “other” band would release their debut album. Dingobats released their debut album, The New Dingobats Generation in 1998. Thomas had just graduated from the University of Trondheim. This was a cause for celebration. So was the release of The New Dingobats. Just like Krøyt’s debut album, The New Dingobats Generation was warmly received by critics. Just like Krøyt, the future looked bright for Dingobats. Two years after the release of Sub, Krøyt returned with their sophomore album Low. Not only was Low released to critical acclaim, but won a Spellemannprisen, the Norwegian equivalent of a Grammy Award. For any Norwegian band or artist, this was the ultimate accolade. For Thomas and the rest of Krøyt it was a cause for celebration. This wasn’t the end of the celebrations. In 2000, Thomas won the Edvardprisen Prize for his composition Silent. It seemed that Thomas could do no wrong. However, he wasn’t for resting on his laurels. Far from it. Throughout his career, Thomas had been a member of various bands and worked with numerous artists. He had worked with John Pål Inderberg’s Quartet between 1995 and 1996. That was the past. However, Thomas was still a member of Skomsork, and had been since 1996. Then there was his work with other artists. Thomas it seemed, lived for music. In 2001, Krøyt released their third album, One Heart Is Too Small. It built on the success of Low, and like its predecessors, won over critics. So much so, that it was nominated for a Spellemannprisen. This time, Krøyt missed out on their second Grammy Award. However, One Heart Is Too Small wasn’t Krøyt’s only release during 2001. Krøyt also released the Body Electric E.P. in 2001. It further cemented their reputation as one of Norway’s top bands. Sadly, despite their lofty position within the Norwegian music scene, Krøyt decided to call it a day. However, Thomas was never short of work. His skills were always in demand. This had always been the case. In 2001, Thomas featured on Lars Erik Drevvatne’s album Keys On and Off. Then in 2002, he played on Ivar Neergaard’s Mulle Miktor Synger og Fantasoferer. It was later, nominated for a Spellemannprisen. This was beginning to be a habit for Thomas. He seemed to have the Midas touch. So what better time for Dingobats to release their sophomore album. It had been four years since Dingobats released their debut album. They released Pöck in 2002. Live Maria Roggen added vocals on a couple of tracks. She played her part in what was a captivating album. It seemed Thomas’ other group were picking up where Krøyt left off. However, it would be another two years before the released another album. In between the release of Dingobats’ second and third album, Thomas played on numerous albums. This included Karin Park 2003 album, Superworldunknown. It too was nominated for a Spellemannprisen. Three would become four a year later. Ever since 1996, Thomas had been a member of Skomsork. They released their eponymous debut album in 2004. It was also nominated for a Spellemannprisen. This was the fourth time in four years. Thomas was like a lucky msucial mascot for Norwegian groups. With Dingobats about to release their third album, this bode well. 2004 had been a busy year for Thomas. He had also worked with Ephemera and Christine Guldbrandsen. Somehow, he found time to record and release Dingobats’ third album Follow. It was perceived by many critics as Dingobats’ finest hour. That was ironic, as it was their swan-song. From 2004, right through to 2015, Thomas T. Dahl has worked as a composer, arranger, musician and producer. He’s the go-to-guy for anyone looking for a guitarist. This includes Linda Fosse Hagen, who brought Thomas onboard for her 2005 album Eit Eventyr. Since then, Thomas has worked with the great and good of Norwegian music. This includes Kristin Asbjørnsen, Heidi Marie Vestrheim, Christine Sandtorv, Siri Gjær and Erlend Skomsvoll. Then in 2007, Thomas worked with Elvin Friendly, Kloster, Erlend Ropstad and Terje Nilsen. There was no rest for one of the hardest working men in Norwegian music. 2008 was just like previous years. Artists were clambering to work with Thomas. Among them were Guttene and Pinocchio. Another project Thomas worked on was Vamp’s album St. Mandag. When it was released, it was to widespread critical acclaim. Later it was nominated for a Spellemannprisen. This wouldn’t be the last album Thomas worked on that was nominated for a Spellemannprisen. In 2009, Thomas worked with Christine Sandtorv. He then worked with Mats Eilertsen on his Radio Yonder album for Hubro Music. Thomas would soon renew his acquaintance with Mats, and later played with the Mats Eilertsen Quartet. However, before that, he had a lot of music to make. 2010 was one of the busiest years of Thomas’ careers. He worked on five albums, including albums by Elg, BMX, St. Satan and Erik Moll. However, the most successful was Jan Toft’s Alle e aleina, which was nominated for a Spellemannprisen. Thomas repeated the feat a year later with another artist, Mats Eilertsen. During 2011, Thomas worked on albums by HighasaKite and Jan Eggum. However, the most successful album he worked on, was Mats Eilertsen’s Skydive. It was released on Hubro Music, and captured the imagination of critics. Then when the nominations for the Spellemannprisens were being announced, Mats Eilertsen’s Skydive found its way onto the list. Not long after this, Thomas began playing with the Mats Eilertsen Quartet. However, he still found time to work with other artists. This would prove useful when eventually, Thomas went from sideman to frontman. That was still to come. Before that, Thomas worked with Kåre Kalvenes and HighasaKite in 2012. Then in 2013, Thomas worked on VHO’s Hem Til Jul album. The last year, he again worked with BMX on their Rozel Point album. However, by then, he was considering his future. Ever since Dingobats released their final album in 2004, Thomas T. Dahl had worked with numerous artists. Now he decided, he wanted to become a bandleader. He wanted to form his own band. Not just any old band though. Instead, it would be one whose roots were in the past, but its music referenced the past and present, to make the music of the future. That bbd became Skydive Trio, which features Thomas T. Dahl, Finnish drummer Olavi Louhivuori and Norwegian bassist Mats Eilertsen. This multitalented trio had a rich musical history and were guaranteed to make music that was innovative and exciting. Previously, the members of the SkyDive Trio have worked together as part of a larger band for a number of years. This shows. They played on Mats’ two previous albums, 2009s Radio Yonder and 2011s Skydive. The trio also played on Mats Eilertsen’s Magnus Opus, Rubicon which debuted at the Vossa Jazz Festival in 2014. However, there’s more to Mats’ career than two albums. Mats debut album was Turanga, which was released in 2005. He followed this up with Flux in 2006. Three years later, and Radio Yonder was released. It was the finest album of Mats’ three album solo career. However, he surpassed this with Skydive. It features a series of bass masterclasses from Mats Eilertsen, one of the most talented bassists in Norwegian music. Just like Thomas, Mats worked with the great and good of Norwegian music. This includes everyone from Tord Gustavsen and The Source, to the Wolfert Brederode Quartet, Parish, and the Håkon Kornstad Trio. Then there’s Food with Iain Ballamy, Jacob Young, Solveig Slettahjell’s Slow Motion Orchestra and the Håvard Wiik Trio. Each and every one of these bands have drafted in Mats to lay down some of his trademark bass lines. So did Thomas T. Dahl when he founded Skydive Trio. All he needed was a drummer. Thomas knew the very man, Olavi Louhivuori. He’s not just a drummer, but a talented percussionist, who sports an energetic and enthusiastic style. Olavi, Thomas felt, was the perfect partner for Mats in the Skydive Trio. Having worked with Olavi before, Thomas saw the young drummer encourage other musicians to leave their comfort zone. Once they did this, they were able to reach new heights of creativity and productivity. Thomas was impressed by Olavi’s ability to bring out the best in much older, and experienced musicians. However, Olavi has an illustrious past. Before turning professional, Olavi Louhivuori studied drums and composition at the Sibelius Academy. This was an important part of Olavi’s musical education. He put this into practise with the Joon Toivanen Trio, the Ilmilekki Quartet and the Sun Trio. Each of these bands won the accolade Young Nordic Jazz Group. Since then, Olavi’s career has flourished. Olavi has toured and recorded with the legendary Polish trumpet player Tomasz Stanko. He has also played with Anthony Braxton, Marilyn Crispell, Susanne Abbuehl and Kenny Wheeler. That’s not all. There’s Olavi’s recording career to consider. Previously, Olavi Louhivuori has released several albums as a solo artist, including Astral Fishing in 2012 and Existence in 2014. Olavi has also released albums with various bands. This includes the Olavi Trio, who released their Triologia album in 2008. However, Olavi’s proudest moment came in 2007, when Oddarang won the Emma Prize, which is the Finish equivalent of a Grammy Award. Since then, the thirty-four year old drummer has been one of the leading lights of the Scandinavian music scene. His decision to join Thomas and Mats in Skydive Trio, resulted in another Scandinavian supergroup. For their debut album, Sun Moee, the three members of Skydive Trio wrote eight tracks. Thomas penned Talbot, Slow Turn and Sun Moee. Mats contributed Bravo, Signs and Becks Back. Olavi wrote Four Words. The other track was a cover of Portishead’s Sour Times. These eight tracks were recording in Copenhagen, in 2014. Recording of Sun Moee took place at The Village Recording, Copenhagen in September 2014. Olavi played drums, Mats double bass and Thomas guitar. 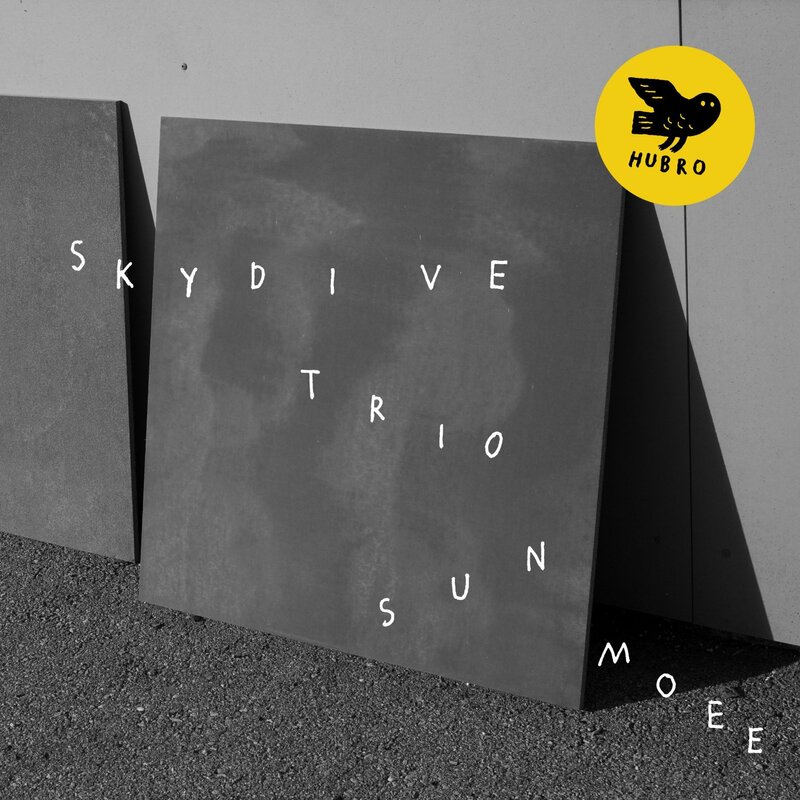 the Skydive Trio arranged and produced Sun Moee, which was recorded by Thomas Vang and mastered Danish jazz drummer Morten Lund. Once Sun Moee was complete, it was ready for release. Sun Moee was released recently on Hubro Music. It was released to widespread critical acclaim. No wonder. Skydive Trio, this innovative and exciting guitar trio compliment each other perfectly on Sun Moee’s eight tracks, which I’ll tell you about. Bravo opens Sun Moee. From the moment Olavi counts the rest of the Skydive Trio in, an understated and mellow arrangement begins to unfold. Olavi’s drums have a mildly mesmeric quality while Mats’ bass meanders along subtly. This leaves Thomas’ crystalline, chiming guitar to take centre-stage. His playing his polished and assured. He eschews flashiness and trickery; instead conjuring up washes of elegiac, summer music. There’s even a nod to Wes Montgomery. Meanwhile, the rest of the Skydive Trio compliment Thomas, as he settles comfortably into the role of bandleader. Slow, thoughtful and cinematic describes the understated sounding Talbot. Gradually, the arrangement begins to show its hidden depths. A weeping guitar and walking bass combine, while Olavi’s drums are slow, subtle and ponderous. Again, Thomas’ guitar moves quickly to centre-stage. He’s not afraid to unleash some quivering licks. Mostly, he plays it straight, his guitar shimmering and chiming. Behind him, the rhythm section become one. They have the effect of encouraging Thomas to greater heights, as his fingers flit nimbly up and down the fretboard. Not once. He’s like a musical wizard, who takes delights in weaving musical magic with his trusty guitar. There’s even some showboating, as Thomas shows just why he’s one of the top guitarists in Norway during this eight minute epic. As Thomas guitar chimes on Slow Turn, Mats’ scrabbled bass takes centre-stage. That’s until Thomas begins to create a wistful, cinematic track. His guitar weaves its way across the arrangement. Behind him, the rhythm section are content to provide the cinematic heartbeat. The music veers between beautiful, thoughtful and wistful, to heartfelt, hopeful and pensive, as the Skydive Trio create what sounds like the soundtrack to a sixties movie. Drums ring out, and the Skydive Trio march to the beat of Olavi’s drums on Sour Times. Soon, Thomas lays down has sparse, crystalline guitar. By then, the drums have become hypnotic, as the bass probes and weaves its way across the arrangement. Thomas decides now is the time to deploy some effects. This adds to the cinematic sound. It’s as if the Skydive Trio are picking up where they left on Slow Turn. As for Thomas, he unleashes some of his best guitar licks. He seems to have reserved a virtuosos performance, as he unleashes blistering, searing quivering licks. Not to be out done, the rest of Skydive Trio play their part, and pick up the slack when Thomas’ guitar drops out. In doing so, they show that Skydive Trio isn’t a one man band. Instead, they’re a talented trio of Scandinavia’s finest musicians. Signs is one of three tracks bassist Mats Eilertsen wrote for Sun Moee. It has an understated and intriguing introduction. Just percussion, probing bass and shimmering guitar combine. Soon, elegiac washes of glimmering, glistening guitar float across the arrangement. They’re accompanied by a scrabbled guitar, slow moody bass and percussion. That’s all that’s needed. It paints pictures in the mind’s eye. It’s also melodic and joyous music, music with a feel-good vibe. When it reaches a dramatic crescendo, you’re tempted to press play again. However, you want to know what happens next. Sun Moee that’s what happens next. At the start, it’s moody and understated. Just a pensive, broody bass, bristling guitar and hissing hi-hats combine. Together, they create a spacious arrangement. There’s plenty of space for the music to breath. This adds to the drama. Soon, the music changes. It takes on a much more hopeful sound. That’s down to Thomas’ guitar as it shimmers, quivers and rings out. Sometimes, it adds bursts of drama. It’s very different from the ominous sound of Mats’ bass. From there, a captivating, beautiful and sometimes dramatic track unfolds. While all the members of Skydive Trio play their part, Thomas and his guitar, play a starring role. Straight away, it’s obvious that Becks Back is one of the most beautiful tracks on Sun Moee. The three members of Skydive Trio play slowly and careful. Especially the rhythm section. They’re responsible for a slow, shuffling arrangement. Atop the arrangement is the slow, thoughtful and elegiac sound Thomas’ guitar. He chooses each note with care, before their crystalline sound shimmers and quivers. Later, Mats plays an equally understated and thoughtful solo on his double bass. He passes the baton to Thomas, who picks up where he left off. Briefly, his playing is quicker and firmer. It’s as if this was for dramatic effect, before he and the rest of Skydive Trio return to his previous understated sound and style. Four Words closes Sun Moee. At the start, it has a much more experimental sound. In the distance, percussion plays, and washes of a guitar can be heard. They’re part of a minimalist arrangement. Skydive Trio caress their instruments. They play with a tenderness. As a result, minimalistic washes of music unfold. Mostly, the music is beautiful and captivating. However, Skydive Trio are stirring. They always threaten to cut loose, and fuse rock and free jazz. Somehow, they hold back the reins. That’s until just over a minute to go. Washes of jagged guitar and rolls of drum threaten to kick loose, but never quite do, on this captivating and genre-melting track. Twenty-one years ago, Thomas T. Dahl made his musical debut with Krøyt. That was the start of a long and illustrious career. After Krøyt, Thomas was a member of Dingobats and Skomsork. That is only part of the story. Thomas T. Dahl also played with the great and good of the Norwegian music scene. Over the past twenty-one years, Thomas has been the go-to-guy for anyone looking for a guitarist. He also has worked as an arranger, composer and producer. However, Thomas T. Dahl had never been a bandleader. That was the only thing he still had to do during a long and illustrious career. That’s no longer the case. Last year, Thomas formed Skydive Trio with Finnish drummer Olavi Louhivuori and Norwegian bassist Mats Eilertsen. This multitalented and mercurial trio recorded their debut album Sun Moee at The Village Recording, Copenhagen in September 2014. Sun Moee was then released recently on Hubro Music. Sun Moee is the perfect showcase for one of Norway’s most talented guitarist, Thomas T. Dahl. His playing takes centre-stage on Sun Moee. Behind him, Olavi Louhivuori and Mats Eilertsen provide the backdrop for Thomas’ guitar wizardry. Although they’re both hugely talented and experienced musicians, it’s Thomas guitar playing that takes a starring role on Sun Moee. The music is variously beautiful, cinematic, dramatic, elegiac, ethereal, mesmeric, sparse, stirring and understated. Elements of jazz and rock melt into one. Occasionally, elements of avant garde and experimental music can be heard. Especially on Four Words, which closes Sun Moee, Skydive Trio’s debut album. As debut albums go, Sun Moee is one of the best albums I’ve heard this year. That’s not a surprise, given Skydive Trio feature three of Scandinavia’s most talented musicians, who showcase their considerable talents on Sun Moee, which was recently released by Hubro Music. ← THE MAGICAL MYSTERY PSYCH-OUT-A TRIBUTE TO THE BEATLES.